Horror is a magnificent beast. It can use classic horror ideas to tell us something more about our world. And in the current era we live in, where we are at our most divided, horror is one of the best way to show our discontentment with the society we live in. Us is a masterpiece of horror, not only in how it terrifies us, but in how it is not afraid to tell us the cold, hard truth. The film follows Adelaide Wilson (played by Lupita Nyong'o), the wife of Gabe (played by Winston Duke) & mother of Zora (played by Shahadi Wright Joseph) & Jason (played by Evan Alex). They head to Santa Cruz on vacation to their beach house; while Adelaide is apprehensive about the trip due to childhood trauma, Gabe is more concerned about making himself look more appealing in the eyes of their white family friends, Josh (played by Tim Heidecker) & Kitty (played by Elisabeth Moss) Tyler, going as far as to buy a speedboat that is definitely not appealing both in look & performance. That night, Jason notices a family standing in the driveway. After Gabe tries to chase them off with his baseball bat, & Adelaide calls the cops, the family disperses, & breaks into the house. It is then that the Wilsons realize that the family is... them. 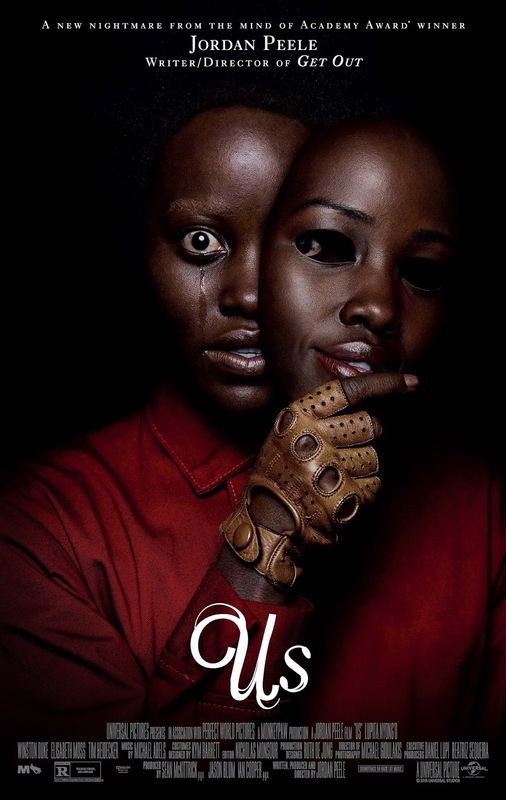 They are doppelgängers: Red (also played by Lupita Nyong'o), the only verbal doppelgänger; Abraham (also played by Winston Duke); Umbrae (also played by Shahadi Wright Joseph); & Pluto (also played by Evan Alex), who wears a mask to hide burns to his face. While trying to defeat their doppelgängers, they must realize why they have come here. The cast is superb. Lupita Nyong'o takes the film by the reins & runs away with it. She pulls off a perfect mix of fear & creepiness that gets under our skin. Winston Duke, Tim Heidecker & Elisabeth Moss also give great performances, but it is Nyong'o's show. Jordan Peele's direction is terrific. Peele not only manages to terrify us in ways that feel fresh or disturb us with suspenseful moments, but also adds a nice touch of dark comedy to ease the tension–somewhat. Jordan Peele's screenplay is brilliant. The plot is fresh & fully intriguing, the characterization is perfect down to the smallest of characters, the dialogue is extremely well-written, & the themes that are explored are very thought-provoking. Michael Gioulakis' cinematography is amazing. The shot composition & framing help add to the tension ever simmering at the surface. Nicholas Mansour's editing is excellent. The film is tightly paced, & not one single moment in the film feels wasted. The sound design is astounding. The sounds displayed are very discordant & quickly unnerve the audience, further heightening the tension. And Michael Abels' score is incredible. Driven by choirs, chimes & violins, Abels' music makes the audience feel more tense. This is the best film of the year so far, & I think that it'll certainly rank highly at the end of the year. It is an impeccably made horror film unlike any we've seen in years. Us was seen by me at the MJR Marketplace Digital Cinema 20 in Sterling Heights, MI on Friday, March 22, 2019. It is in theaters everywhere. Its runtime is 116 minutes, & it is rated R for violence/terror, & language. Great review! I had a few issues with it but even so it's still one of my favourites of the year so far. Can't wait to see what Peele does next! Thanks! It's my #2 of the year so far, behind The Beach Bum.